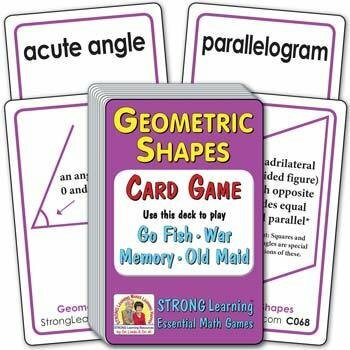 Players learn geometric shapes, terms, and facts, all while while playing popular card games. For this deck, matches are cards with a geometric term on one card and a picture of the geometric shape or concept described by the term on another. Contents: 54 standard size cards, 3.5 x 2.25 in. (includes 48 playing cards, directions card, answer cards and Old Maid card).